Whether you’re feeling flush, or feeling the pinch, I’ve got some fantastic wines for you, full of good cheer as we celebrate Christmas and then wave the old year goodbye. Prosecco has become our party pop of choice in amazing double-quick time. It only seems like yesterday we were all carting off supermarket Cava to our Christmas bashes in vast quantities. Well, Prosecco’s probably a better party pop, and you don’t have to buy the most expensive. This one from Spar is delightfully fresh and fruity, with a cascade of soft, foaming bubbles. This is a ‘grower’ champagne – from a single grower using his own grapes, not from a big blending vat like most champagne. Grower champagnes do have a lot of flavour, and they can be pretty wild, but you really get a taste of the vineyard’s fruit. This one is from the village of Bouzy – there’s a Christmas name for you; it’s just up the road from Dizy! I’m not joking! Bouzy wines have some of the most powerful fruit in Champagne – cooked strawberries, apple core, blossom and spice. It tastes almost good enough to drink without the bubbles. But it tastes much better with them. If you want the tastiest cheap Chardonnay on the shelves this Christmas – look no further. 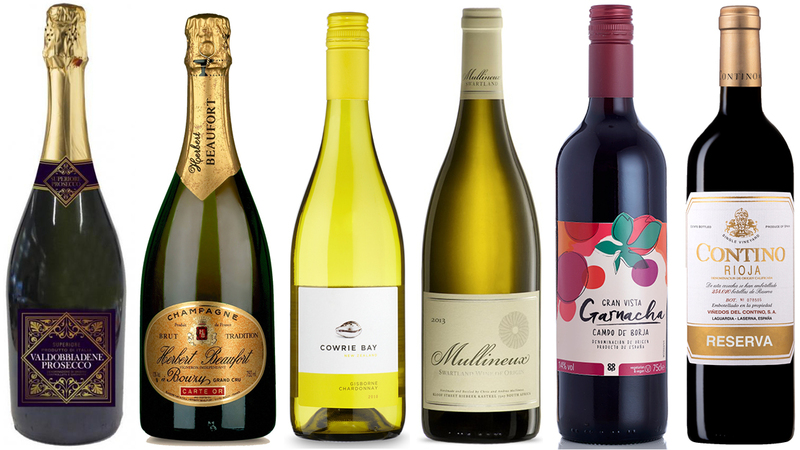 Chardonnay has been New Zealand’s unsung hero for years now – but not at this price. Waxy, glyceriney, toasty, with lush, fat, ripe, but bone-dry fruit, and just a tiny splash of soft creamy oak to round it off. I’m thrilled to see a wine like this widely available in the UK. The Mullineuxs are just about the coolest winemakers in what is the increasingly hip world of South Africa, and they get their grapes from old, forgotten patches of vines in trendy Swartland. Frankly, they’ll throw in whatever grapes they like the look of – there are 5 varieties here, led by old vine Chenin, and including the rare but exciting pink Semillon Gris. The result is an uplifting, fascinating mishmash of pastry and cream and leaf and syrup and peel. I can’t believe a £4.99 wine can taste this good, but the Co-op are past masters at ferreting out tasty stuff and then not overcharging us for it. Garnacha is the great grape of Spain’s warm heartlands, and the Bodega which makes this is a star producer of crunchy, juicy, spicy, peppery reds, bursting with plum and raspberry fruit. Another wine I’m delighted to see widely available in bigger Sainsbury’s stores. Contino is a fabulous operation. Rioja has until recently always been about blending various batches of wines together. Contino was the first ever single vineyard wine made at its own estate winery, and it is still one of the best Riojas you can get. It’s so utterly smooth and easy to drink, yet it has a fascinating, ever-changing flavour of cranberries, raspberries, blueberries and spice that keeps you enthralled to the last drop.